Description : En bois. Hauteur : 26 cm. Largeur : 20 cm. 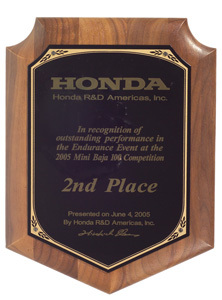 Prix : 2nd Place - In recognition of outstanding performance in the Endurance Event at the 2005 Mini-Baja 100 Competition.